Garrett – Alelia A Barry, 96, of Garrett, died Thursday, March 28, 2019, at Presence Sacred Heart Home in Avilla. She was born October 12, 1922 in Altona to Raymond and Mozelle (Davis) Anderson. She was a 1941 Graduate of Garrett High School. Alelia was a dedicated homemaker and mother, and served for many years as the head bookkeeper at Electric Motors in Garrett until her retirement in 1992. She was a member of the St. Joseph Catholic Church in Garrett. 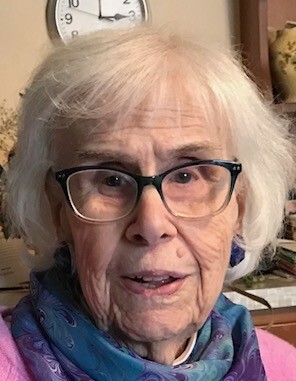 Alelia was an avid bridge player, belonging to many Bridge Clubs in the area; it was a passion she enjoyed that kept her mentally and physically active until her final days. She was also a member of Sigma Phi Gamma. Most importantly, she was known and loved by so many people throughout the Garrett and Auburn communities, and all who knew her were drawn to her warmth, her love of people and her caring manner. Alelia married Kenneth E. Barry on April 17, 1943, in the St. Joseph Catholic Church, Garrett, and he died June 20, 1974. Surviving are her sons, Kenneth P. (Sharon) Barry of Scottsdale, AZ, Timothy J. Barry of Gravette, AR, Thomas S. (Debbie) Barry of Auburn, IN, Gery J. (Hollis) Barry of Essex, CT, and Richard P. (Jody) Barry of Zionsville, IN; a daughter, Judy (Paul) Marlow of Auburn, IN; and her brother, John Lee Griffith of New Mexico. She is also survived by 15 grandchildren and numerous great-grandchildren. In addition to her husband, Alelia was preceded in death by her parents; her grandson, Timothy Barry; and her brother, Paul Anderson. Services will be 11 a.m. Monday, April 1, 2019, at the Immaculate Conception Church, 500 E. Seventh St., in Auburn, with burial to follow in Christian Union Cemetery, Garrett. Visitation will be from 2 - 6 p.m. Sunday, March 31, 2019, at Feller and Clark Funeral Home, 1860 Center St., Auburn. A rosary will be recited Sunday at 3:30 p.m. at the funeral home. Preferred memorials are to the American Heart Association or St. Joseph Catholic Church.